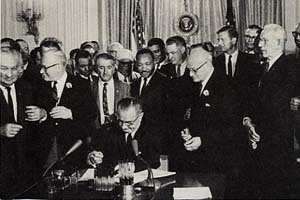 ...1965, U.S. President Lyndon Baines Johnson signed into law the Voting Rights Act. (credit for signing ceremony; directly behind LBJ is Rev. Martin Luther King, Jr. (prior posts)) The Act made certain restrictions on voting, which had been used to deny African-Americans the vote, violations of federal law. According to this site, "A recent march in Alabama in support of voting rights, during which blacks were beaten by state troops, shamed Congress and the president into passing the law, meant to enforce the 15th Amendment of the Constitution ratified by Congress in 1870." The U.S. Supreme Court has just been asked to review challenges to this 1965 Act, as SCOTUSblog's Lyle Denniston details here.